10 selections including Fresh Ground Espresso, Ground American coffee, Lattes, Cappuccinos, Hot Chocolate, French Vanilla. 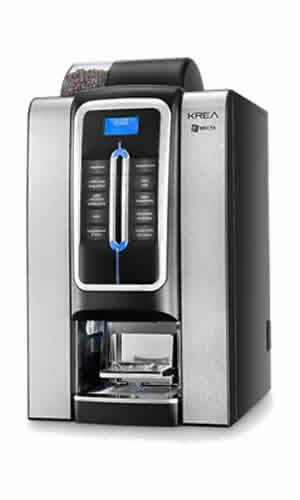 Description: The Krea coffee brewer is ideal for office with 50 or more employees. The modern and elegant design is highlighted by LED lights, chromium plated selection buttons and striking side panels. Perfectly measured and brewed espresso can coffee drinks as well a variety of milk based drinks make this brewer a favorite for any business who wants the best in bean to cup technology.